Blood circulates because of differences in blood pressure. Blood flows from areas of higher pressure to areas of lower pressure. Blood pressure is greatest in the ventricles and lowest in the atria. 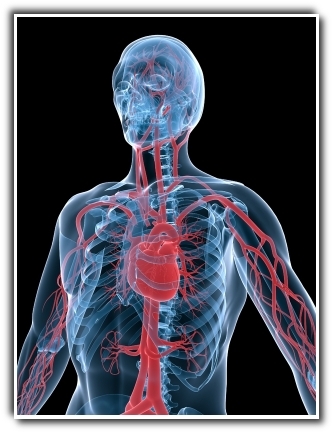 Contraction of the ventricles creates the blood pressure that propels the blood through the arteries. However, the pressure declines as the arteries branch into an increasing number of smaller and smaller arteries and finally connect with the capillaries. The decline in blood pressure occurs because of the increased distance from the ventricle. By the time blood has left the capillaries and entered the veins, there is very little blood pressure remaining to return the blood to the heart. The return of venous blood is assisted by blood. This method of moving venous blood toward the heart is especially important in the return of blood from the upper and lower limbs. Respiratory movements aid the movement of blood superiorly toward the heart in the abdominopelvic and thoracic cavities. The inferior movement of the diaphragm as it contracts during inspiration decreases the pressure within the thoracic cavity and increases the pressure within the abdominopelvic cavity. The higher pressure in the abdominopelvic cavity forces blood to move from the abdominopelvic veins superiorly into thoracic veins, where the pressure is reduced. When the diaphragm relaxes and moves superiorly, the thoracic and abdominopelvic pressures reverse. Backflow of blood into the veins of the lower limb is prevented by the presence of venous valves.Gravity aids the return of blood in veins superior to the heart. The velocity of blood flow varies inversely with the overall cross-sectional area of the combined blood vessels. Therefore, the velocity progressively decreases as blood flows through an increasing number of smaller and smaller arteries and into the capillaries. Then, the velocity progressively increases as the blood flows into a decreasing number of larger and larger veins on its way back to the heart. Blood velocity is fastest in the aorta and slowest in the capillaries, an ideal situation providing for the rapid circulation of the blood and yet sufficient time for the exchange of materials between blood in the capillaries and the interstitial fluid surrounding tissue cells.